Conetainers are filled and sown in late fall and irrigated thoroughly prior to winter stratification. Plant is mature within 3-4 years, the lifespan is not reported. 1. DeSanto, Jerry; Luna, Tara; Evans, Jeff; Wick, Dale. 2004. 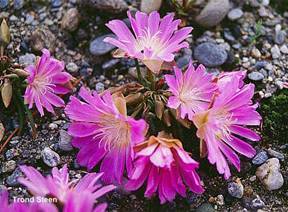 Propagation protocol for production of container Lewisia rediviva Pursh plants (116 ml conetainers); Glacier National Park, West Glacier, Montana. In: Native Plant Network. URL: http://www.nativeplantnetwork.org (accessed 17 May 2005). Moscow (ID): University of Idaho, College of Natural Resources, Forest Research Nursery.